I must admit that I was disappointed when this next issue of FLASH showed up, folded in half, in my mailbox. And that’s because the previous issue indicated that it was going to be a Giant-sized issue, a format that I loved. Alas, at some point in the intervening sixty days, a change was made, and only an ordinary-sized issue was released. Eventually, I’d get to read all of the reprint stories that had been selected for the aborted Giant-sized version in places like FOUR-STAR SPECTACULAR, but my disappointment was still palpable. On the good side, this was the start of a storyline that felt like a huge epic to me as it was first coming out, the first storyline I’d ever read that went longer than two issues (it ran three.) The interior artwork by mainstay Irv Novick, a creator that I associate with the Flash to this day, was scratchily inked by Tex Blaisdell in this instance, not the greatest stylistic match. I can remember sorting out all of my issues by creative team and trying to work out what the difference was–at this point, I really didn’t understand what inking was, but I could tell the difference on the finished page. 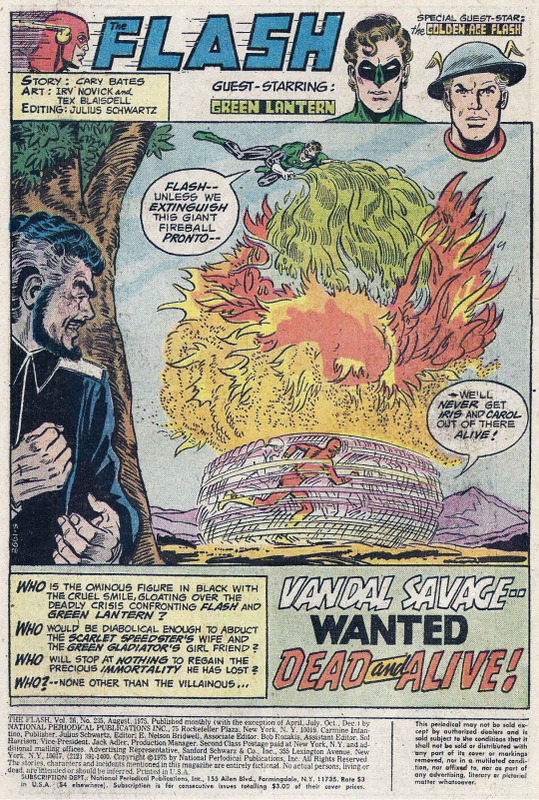 This story also introduced me to Vandal Savage, a mainstay DC villain whose history extended back to the Golden Age. 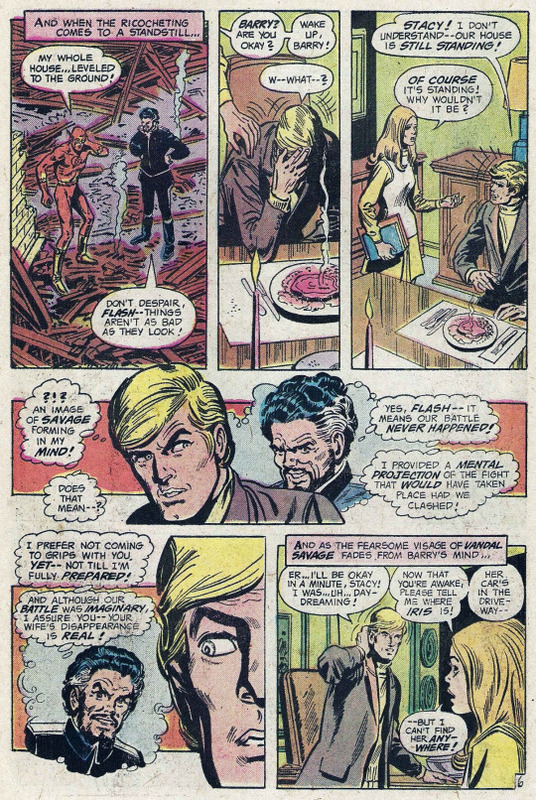 Here, the issue opened with the Flash racing home, having been delayed by some super hero activity from a dinner with his wife, Iris. 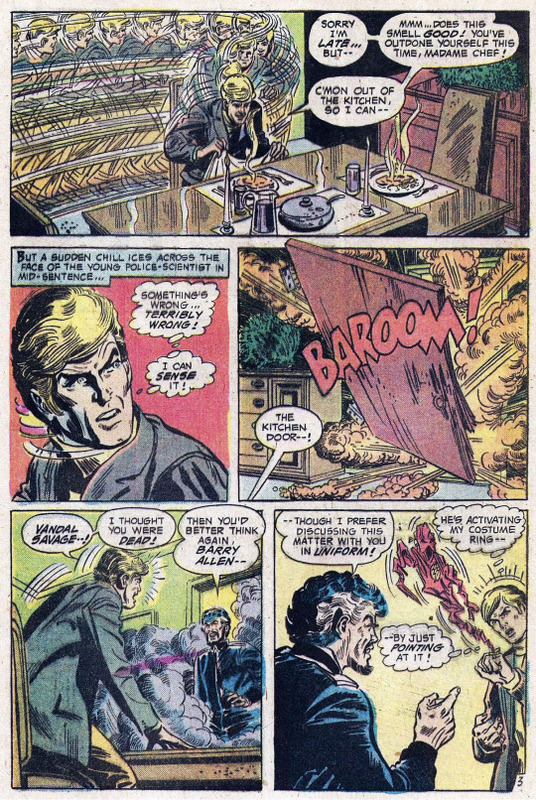 Arriving at the Allen residence, he finds Iris absent, but the villainous Savage in attendance. 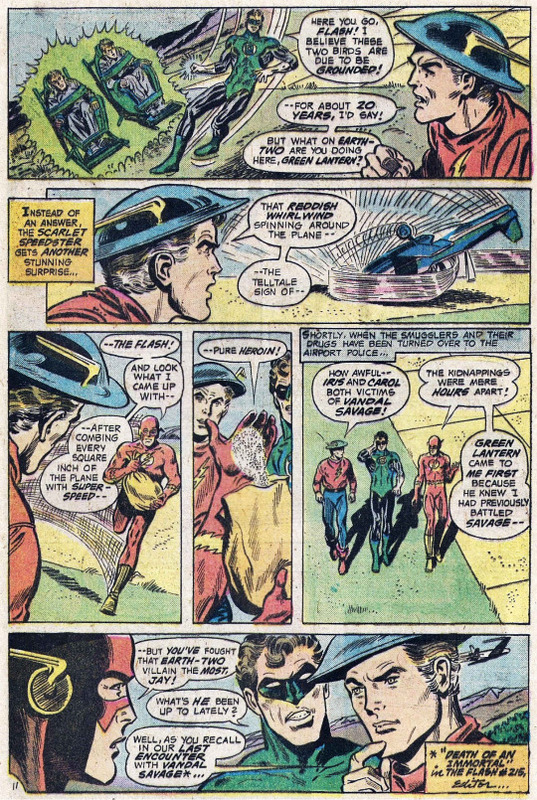 Flash engages his immortal foe, and through the course of their scuffle, the entire house is destroyed! Fortunately, the encounter was just an image planted in Barry’s mind by Savage. But Iris’s disappearance is very real. 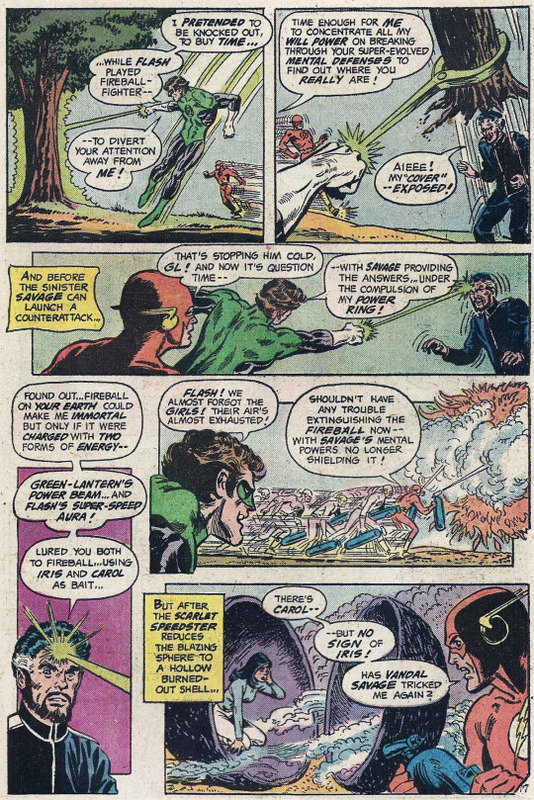 Meanwhile, in Coast City, Hal Jordan is similarly confronted by Vandal Savage, who claims responsibility for the disappearance of Carol Ferris. The action then cuts to Earth-2, where Jay Garrick is attempting to corral some fleeing criminals in a plane. He is aided by the arrival of both Green lantern and the Earth-1 Flash, who have sought him out due to his experience in dealing with Savage. The three heroes compare notes, but Jay begs off on providing greater assistance–he says that he’s in the middle of a more urgent crisis right here on Earth-2. Returning to Earth-1, Flash and Green lantern are lured across the country by images of Iris and Carol until they are confronted by a huge fireball, in the center of which seems to be the two women. The two heroes surge forward, intending to snuff the flames before they eat up all of the oxygen within the sphere, but their efforts boomerang upon them time and again. But this is at least partially a ruse, to allow Green lantern the time for his Power Ring to locate Savage’s whereabouts. 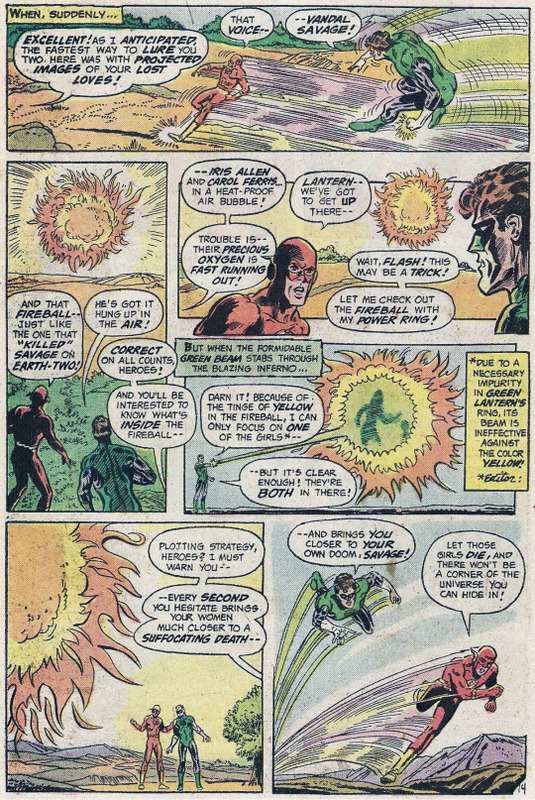 Turns out that Vandal is trying to regain his lost immortality, and he can do so with the fireball provided it has been charged by Flash-s super-speed and GL’s ring energy (in a manner that, frankly, doesn’t make a bit of sense. But roll with it.) Now that Savage can’t prevent their efforts, Flash is able to put out the flames–but when the sphere is broken open, only Carol Ferris is within. His bluff revealed, Savage reveals admits that he’d intended to abduct Iris as well as Carol, but she was already missing when he had arrived. but he went ahead with his plan anyway, taking advantage of that fact. 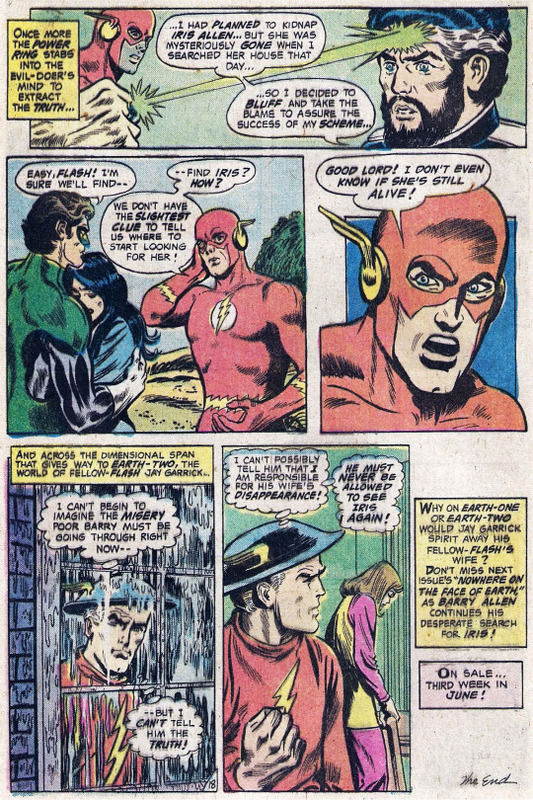 But now, Flash is still faced with the disappearance of his beloved wife, and absolutely no clues as to her whereabouts. But not so we readers, as the narrative switched back to Earth-2, where we see that Jay Garrick is responsible for Iris’s disappearance, and he vows that Barry can never see her again! Dun-dun-duuuun! To be continued!